Have you wondered about what the Northern Lights actually are, and where they come from? Being blessed the last weeks of September with early Northern Lights shows in Molde, a lot of questions have been raised by new students about what Northern Lights now actually are and how they come to be. Therefore, we will help you out to make sure you can enjoy Mother Nature’s most unique creation even more! Yes, you read that right, this incredible phenomenon can be observed on both magnetic poles. In southern Argentina or New Zealand you have Aurora Australis, the Southern Lights. As you might have seen or experienced already, Northern Lights can have a wide spectrum of colors. Ranging from green to pink to violet, the spectrum is endless and depending on which gases the particles from the sun collide with. The lower altitude in the atmosphere these collisions take place, the greener it is – the higher altitude the more it goes toward a red’ish color. So to humanize these scientific explanations: particles come from the sun to show us nature at its finest by interacting with the Earth’s atmosphere and showing us colors like never before! So when is it exactly that we have the most chances of seeing Northern Lights? Now is actually the time which is called «high season» to see Northern Lights. From late September to mid October, and beginning of March ‘til end of March, is the best period to be astonished by this uniqueness in Molde. Just so you know, Northern Lights are actually always present. Being influenced by the activity on the sun, it is actually there all year round, only just not visible to the naked eye. The solar winds can then intensify this process and make them visible to us. Several indexes can be used not to make us go out each and every evening and see if something is there. One of the most important indexes is the KP-index. This is a scale from 1-9 called the planetary index: 1 being very little geomagnetic activity, and 9 being extreme geomagnetic storming, as mentioned by aurora-service.eu. What kp value do we need then to see auroras? In our case, Molde has a kp number of approximately 3-4. This means that from the moment the kp index is around 3 or 4, there are chances of seeing Northern Lights in our region. However, aurora prediction is still in its infancy, so never take the predictions for granted. Kp index is also just one indicator. Other conditions for optimal viewing are: clear sight towards the north, no clouds, and complete darkness. A few hours before and after midnight are usually the best moments to experience unique shows as the lights are usually the strongest around that time. People might tell you, you have to go to Lapland or to northern Norway to see Northern Lights. 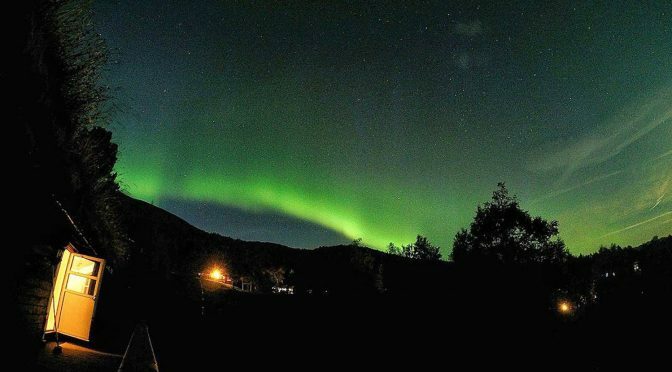 However, as some of you have experienced already, it is also possible here in pretty little Molde to see Northern Lights. As we are looking for an un-obscured spot with an outlook on the northern horizon, it is very important to look for places with as little light pollution as possible. Two recommendable places in Molde consequently are Kringstadbukta (the local beach down from the university) or Varden (our local mountain with panoramic view). To help us out with the continuous chase to see more auroras, several apps have been developed. Two of the most commonly used apps are «Norway lights», who also have a website, and the «Aurora» app. They can help you in the process of seeing your next Northern Lights show. We can never take them for granted, as it is unique each and every time. You might not always see them, but that’s what makes it so unique, right?